Explore Panem like a pro with our newest guide. Popular Facebook game The Hunger Games Adventures just debuted on the iPad, giving millions of fans the chance to enjoy their favorite series on the go. Not only will they interact with characters from the franchise, including Katniss Everdeen, but they'll also explore new areas of Panem. If you intend to venture beyond the fence of District 12, Modojo's The Hunger Games Adventures cheats and tips guide will teach you the basics while providing some helpful tricks of the trade. As with most freemium games these days, The Hunger Games Adventures lets you buy virtual currency, in this case, Credits and Goods. Having plenty of both means you can purchase different items and top off your character's energy whenever you want with no interruptions. Of course, there's a price to pay. 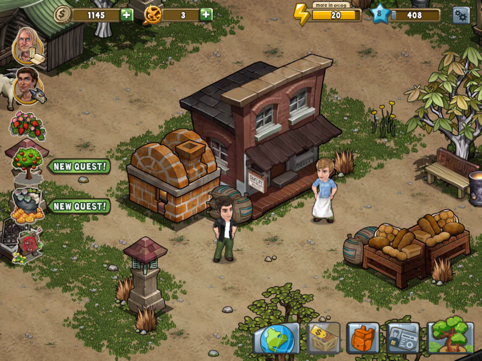 Aside from walking around, all actions performed in The Hunger Games Adventures expend energy, represented as points on the top right area of the screen; AKA, the yellow lightning bolt. When that meter reaches zero, your character won't be able to complete missions, and you'll need to wait for the energy bar to refill over time. Either that, or you can replenish it with Credits. Leveling up is one of the more important things you can do in The Hunger Games Adventures. For starters, doing so increases your character's energy points. In addition, you stand to gain various rewards, and new content will become available. What's the easiest way to level up? Completing quests. Tip: Some items unlock upon reaching a certain level or completing a quest. Finishing quests moves you one step closer to leveling up and will advance The Hunger Games Adventures' plot. You'll find a list of all active quests on the left side of the screen. If you can't figure out the next step to completing a quest, tap the character associated with that particular quest, view the list of objectives and press the "Show Me" button to let the game point things out. If you need to visit The Justice Building, The Supply Depot or The Bakery in a hurry, press the Panem map button on the lower right, then select the exact location you wish to travel to. You'll only be able to visit places you've unlocked. Tip: Cycle between the last two places you visited by tapping the tree icon, located to the far right of the Panem map button. You'll find all sorts of cool stuff, from makeshift traps to orange trees, at the store. Just make sure you bring enough coins to buy everything you need. Tip: If you see the Coin icon above an item, this means you can collect money and resources. Each item you bring into the game benefits your character over time. A Big Campfire, for example, brings in 50 coins every hour, while the Shelter nets eight energy points every eight hours. Think about that before making a purchase. You're free to change outfits by pressing the ID icon on the lower right. While playing dress-up, make note of the Capitol Couture button. Pressing it displays a new set of outfits that'll become available once you reach the Capitol, but you'll need Credits to acquire these stylish threads. Just because you purchased a well doesn't mean it'll sit in your Forest Escape forever. In fact, you can sell it for some Coins. Simply press the object, then click the Sell button. You can also move items around.